Splitting the algebra Psd of pseudodifferential operators into the Lie subalgebra of all differential operators without a constant term and the Lie subalgebra of all integral operators leads to an integrable hierarchy called the strict KP hierarchy. We consider two Psd modules, a linearization of the strict KP hierarchy and its dual, which play an essential role in constructing solutions geometrically. We characterize special vectors, called wave functions, in these modules; these vectors lead to solutions. We describe a relation between the KP hierarchy and its strict version and present an infinite-dimensional manifold from which these special vectors can be obtained. 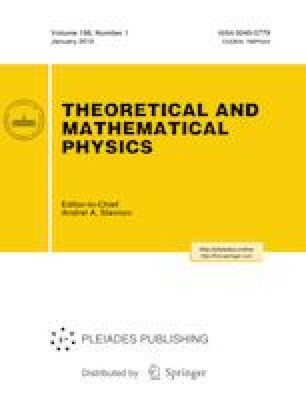 We show how a solution of the strict KP hierarchy can be constructed for any subspace W in the Segal–Wilson Grassmannian of a Hilbert space and any line ℓ in W. Moreover, we describe the dual wave function geometrically and present a group of commuting flows that leave the found solutions invariant. Prepared from an English manuscript submitted by the authors; for the Russian version, see Teoreticheskaya i Matematicheskaya Fizika, Vol. 198, No. 1, pp. 54–78, January, 2019.